Want to make beats like Dre? Here's an odd paradox: while hip-hop has the lowest entry-level of all genres - all you really need to perform it is a mouth and maybe a mic - producing appropriate beats for your tracks can be intimidating. Hip-hop has so many recognised masters and defining styles that fabricating a winner can feel tricky. As with all production, making great beats depends on getting the fundamentals right - and that's what this guide is about. Whether you aspire to be the next J Dilla, a newschool DJ Premier, Just Blaze's second coming or something else entirely, there are certain key elements that it pays to get right from the start. You won't use all of these techniques all of the time, but if you start producing tunes without this knowledge tucked away in your mind, you'll find things very difficult indeed. You should try to use these tips as a springboard for your own style. Nothing will set you apart as a great producer faster than applying your own unique style and spin on things. Get the basics down and then start innovating and producing beats that will have MCs banging on your door. What are you mixing your song for? If you want it to be a huge radio and club hit, you'll need to focus your energies on making everything as hard-hitting and powerful as possible. But if your song isn't going to make it into a club sound system or onto the stage, it pays to spend some extra time focusing on the details of your track - things that will be picked up by someone listening intently in their living room, rather than someone dancing their behind off on the floor. If you're making a track for an MC, one of the most enjoyable ways to show off his or her (and your) skill is to create a track that mutates as it progresses. Forget traditional hooks and verses: start with a simple drum beat, then gradually begin adding other elements to it. Once things have built up, you can start twisting the drum beat and switching tempos and rhythms, in order to create an ear-catching track. Get your MC to freestyle in the booth and listen as they try to keep up with the changing rhythm. Most of the time, you'll want your effects to be largely 'wet' - but don't underestimate the appeal of dry, 'cold' sounds, either. Used sparingly, a completely dry instrument can have a great effect in a track; just ask Pharrell Williams! Try working with untouched synth strings or the odd pure tone. This sort of sound will have the greatest effect if your track has a very minimal drum beat and/or lots of space in the arrangement and mix. By all means, go digging through the archives to find great songs to sample, chop up and use in your tracks - but be careful. For nearly as long as sampling has existed, people who make records have been suing those who 'borrow' their sounds. If you're not a well-known artist or signed to a major label then the chances are you'll slip under the radar - until your track with that great James Brown sample takes off, at which point you could be in a whole heap of legal trouble. If you're serious about using samples, invest money in getting them cleared (there are services that do this) or use royalty-free ones only. Quantisation is a tricky issue in hip-hop. Turn it off and your tracks will exhibit a human touch - but in a genre where flow, rhythm and tempo are very important, doing so can often be counterproductive (not to mention disruptive for your MC). Chances are, you'll want to have your DAW's quantise function turned on for most of the time. It's often better to activate it while laying down the notes and then manually tweak them afterwards so that they sound a little more natural and human, if necessary. Don't be afraid to use unusual sounds in your tracks - it can often add a level of shine that puts your song above others. In Nas' classic single Nas Is Like, producer DJ Premier underscored the hard-hitting drums with the sound of birds chirping, creating one of the most recognisable loops in hip-hop. If you've got a microphone to hand, try recording unusual percussive sounds, and layering and processing them to create something a little bit different. It can often be tempting to overload your track with elements, throwing in dozens of samples and drum breaks. While this can be effective, it can also lead to a muddled track with too many different things competing with each other for space. Some of the best hip-hop tracks are built around two or three very simple elements - think Dead Prez's Hip-Hop, which consists of nothing more than a bass drone and some ultra-simple percussion. Have a go at producing a track with just a simple drum line, a couple of sparse keys and a bassline. Heavy guitar riffs are among the most misused sound elements in rap. While there are certainly songs that use them well, many end up sounding discordant and cheesy - as Lil Wayne found out with his disastrous rock project Rebirth. If you do decide to lace a hip-hop beat with some rock riffs, don't go overboard, and EQ them wisely to create room for other elements in your track. Horns are perfect for setting off a rap track, giving your production an instant injection of energy. The key to an effective horn sound is layering different examples on top of each other. For example, a simple sequence of high-pitched, rapid-fire horns will sound a lot better if they're underscored by a steadier, lower-pitched horn sequence. With a little clever panning, you have a great foundation for a beat. 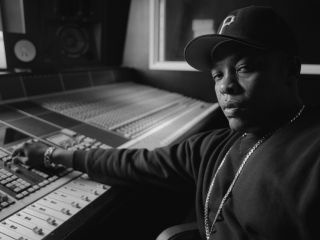 New hip-hop producers often start out by trying to make their tracks sound like Dr Dre, DJ Premier or J Dilla - as we have in this tutorial. This emulation technique is good for developing your ear, and is absolutely fine… up to a point. Remember that while using the styles of these producers as a jumping-off point is OK, you don't want to emulate them too heavily. Rather, you should focus on creating your own sound and your own take on things - it'll help you to stand out from the crowd in the same way that they did.